Whenever we went to his place, my Gramps always tried to give his grandchildren wholesome and, as he called it, "pure" food. He kept a vegetable garden, and grew mango, papaya, banana and guava trees in his backyard. He knew a person who kept cows and got them to deliver fresh milk every morning and evening. He also kept bees for honey. 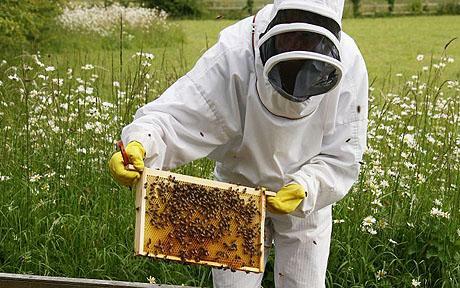 This was part of a cooperative - they would come over to check the bees and collect the honey and beeswax. We would get a share of the honey - I can taste the wild, rich flavour even today. Best of all, the bees NEVER stung. Gramps moved house recently and had to give up up bees and fresh milk and is only creating a new garden. But he instilled in all of us a preference for fresh, handmade, natural produce and products created with care and love. More than 15 years ago, Ohio-based Amy and David Rzepka began keeping bees on their family farm, when a co-worker asked if they would look after a hive he could no longer care for. One day, David took a look at his shampoo label and was shocked by some of the chemicals listed. A health-conscious couple who wanted their children to eat healthy, they decided to manufacture skin and hair care products from the honey, propolis and beeswax in their own hives. The process began nine years ago in their basement. Today, they run an established manufacturing unit and their family business, named Beessential, is known for 100% natural, environment-friendly products hand-made in the US using pure honey, beeswax and other harm-free ingredients. Scroll down for more about Beessential products and my thoughts on them. Beessential products (PR samples) are not tested on animals and they are sulphate-, paraben-, preservative- and phthalate-free. The Bee Calm & Carry On soap looks so pretty that I did not want to use it at first. I love the marbled design. It smells mild, lathers easily and costs $5.99 a bar. I often interchange shower gels and bar soap - I used to be a shower-gel-person but an Aussie friend told me all about "soap-dodgers" so I use both.The fragrance of this soap is calming but not overpowering, and the lather does not strip my skin. The lip balms come in six fragrances - lemon & lavender, honey, peppermint, coconut lime, rose mint and orange ginger. Of these, lemon & lavender has a rating of a whopping 9.8 on TotalBeauty, and is their number one lip balm. It costs $2.99 a tube. Natural skincare has always appealed to me, and these are gentle and pampering on my skin. I love everything I have tried - the lip balms are top-class, and the body cream is rich and kind to my dry skin in this weather, while the body wash and soap bar are creamy, invigorating and smell fabulous. If you are looking for a 100% natural, handcrafted, cruelty-free skin- and hair care and bath and body brand that does not break the bank, look no further. The products come in a variety of fragrances, so if you dislike lavender, you can choose grapefruit, or rose mint, or yoghurt and so on. I showed them to Gramps over the weekend and he went all nostalgic about his bees. Beessential has successfully adopted the bees' policy of sharing their work and providing many benefits for humans. Their award-winning products are available here. Best of all, ten per cent of all profits are donated by Beessential to a charity of your choice at SweetYear.Org. Thoughts on natural skincare products? Do you like honey in your skincare? Tell me in the Disqus comments widget below.